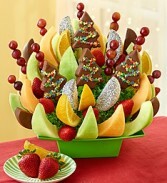 This “fa-la-la-la” fresh fruit arrangement is loaded with holiday spirit! 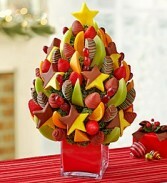 Juicy orange slices, plump strawberries, mouthwatering melon and more mix & mingle with Christmas-tree shaped pineapple slices and apple wedges, dipped and decorated to taste their very merriest. 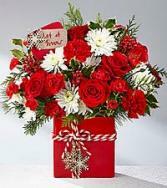 Presented on a reusable green tray, it’s the sweetest way to celebrate the season. 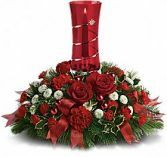 Bring star power to the table this year with a lush holiday centerpiece cradling a ruby red glass hurricane lamp decorated with a shooting star. 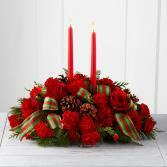 Light the candle of this Christmas centerpiece and watch your guests' eyes light up. This year, next year, and for many holidays to come. 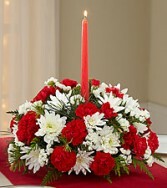 •The festive Christmas floral centerpiece includes red roses, red carnations, red miniature carnations, white button spray chrysanthemums, variegated holly, white pine, noble fir and cedar accented with red ribbon. 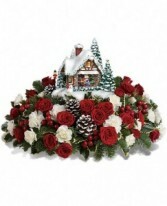 •Approximately 20" W x 16" H.
THOMAS KINKADE'S " A KISS FOR SANTA"
Mommy steals a kiss from Santa Claus inside this warmly lit winter cottage atop a magnificent bouquet of festive red roses, snowy white carnations and fresh Christmas greens! Complete with glowing Christmas lights, this hand-sculpted, hand-painted Thomas Kinkade keepsake will delight for years to come. 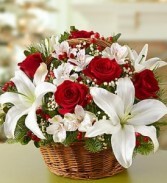 Inspired by the traditional bouquets found in bustling European flower markets this time of year, our florists have hand-arranged the freshest red roses, white lilies and greens inside a charming handled basket. 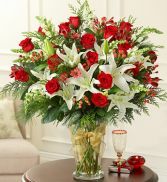 Filled with the classic colors of Christmas, our exclusive bouquet is a wonderful gift to thank the party hostess or to use as a centerpiece in your own holiday home. 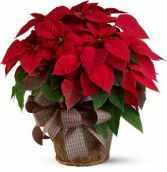 Beautiful Red poinsettia Bushes. 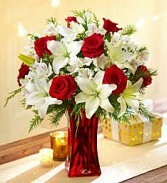 Two plants with foil and bow is $45.00. 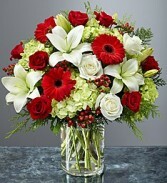 Two plants with a basket as shown is $55.00. 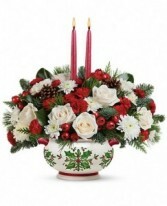 Two Plants in Ceramic Pot is 65.00. 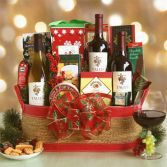 This excellent Basket is filled with 30 Assorted K-cups, Cookies, Box of Harry of London Chocloates, Mrs. Fields Cookies, Chocolate Covered Cherries, Ceramic Mug and all together in a Fancy Santa Basket. 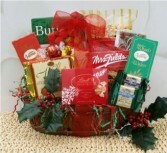 When you can't be there in person, you can send them a big warm hug with our basket full of holiday treats. 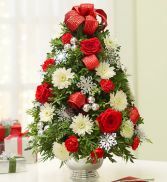 A cuddly plush white teddy bear sits atop a delicious mound of holiday goodies. 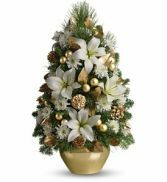 They will enjoy Angelina sugar cookies, Lady Walton's cinnamon-sugar butter wafers, Jelly Belly jelly beans, peppermint bark, holiday tea cookies, Bellagio gourmet hot chocolate and a bag of Ghirardelli® dark chocolate squares. They'll feel this cuddly bear-hug from miles and miles away! Some substitutions will be amade apon availability. 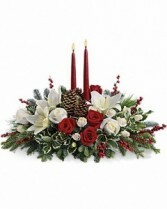 The Holiday Traditions Bouquet speaks to the time-honored customs and cherished traditions of the Christmas season with its gorgeous design. 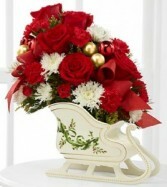 Red roses, white chrysanthemums, red mini carnations and assorted holiday greens are artfully arranged within a white ceramic sleigh-shaped vessel embellished with green, red and gold accents. 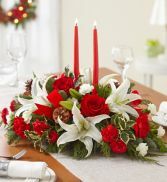 Red and gold glass balls and red ribbon are woven throughout this arrangement, giving it the holiday charm that will captivate your special recipient. 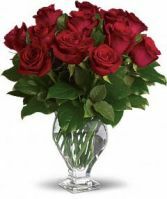 GOOD bouquet includes 4 stems. 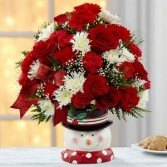 Send happy holiday wishes to everyone on your list with this festive bouquet of red and white blooms designed in a smiling ceramic snowman. Full of holiday cheer. 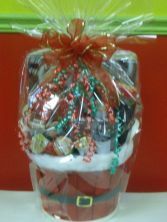 Basket filled with all the favorites, lindt, Mrs. Fields, ghiradeli and more!